There's a Card for That: #Birthday Boys | ft. Clearly Besotted "It's Good to be Bad"
#Birthday Boys | ft. Clearly Besotted "It's Good to be Bad"
Today I'm going to share with you another of my #birthday cards. There have been a couple others, that you can see here (with the three little pigs) and here (with Goldilocks and the three bears). All three of these are so super cute and again I just could not resist the urge to put this into a Polaroid frame. So, I don't actually have a Polaroid frame die, so I have to make my own, which is incredibly easy. I used a square die and a larger rectangular die around it. Pass that through the die cutting machine, and if the bottom is a little too long, just trim it off. This is also something you could totally do by hand as well, using your paper trimmer or a straight edge. To begin, I made my frame and cut out an acetate piece as well. The acetate isn't really necessary but I think it gives a finished look to the picture. On a separate piece of 110lb Copic-friendly cardstock, I stamped this trio from Clearly Besotted's "Good to be Bad" stamp set with Memento Tuxedo Black ink and coloured them with Copics. I then masked them off and used Twisted Citron and Mowed Lawn Distress inks for my grass; Tumbled Glass and Salty Ocean Distress inks for my sky. Then I put my picture together. I adhered it down on a piece of Kraft cardstock, because to me it looks like a bulletin board. I know I had a linen background stamp that I think would work perfectly to give that cross-hatched look but do you think I can find it anywhere? Nope. My washi tape is rather thin, so I find that if I double it up it is a bit less transparent. I chose this particular patterned tape because I wanted it to coordinate with the sky and grass in the photo. Finally I stamped the greeting using the hashtag from "Good to be Bad" and the Happy Birthday from "Wild Thing". Then I adhered the panel to the front of a standard A2 sized card base. Such a cute card! Very clever of you to make your own polaroid frame. Gonna have to try that! So glad you joined us at CASology this week. This is so adorable! Gorgeous coloring and super clever to create your own polaroid! 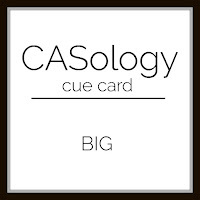 Thanks for playing along with CASology!